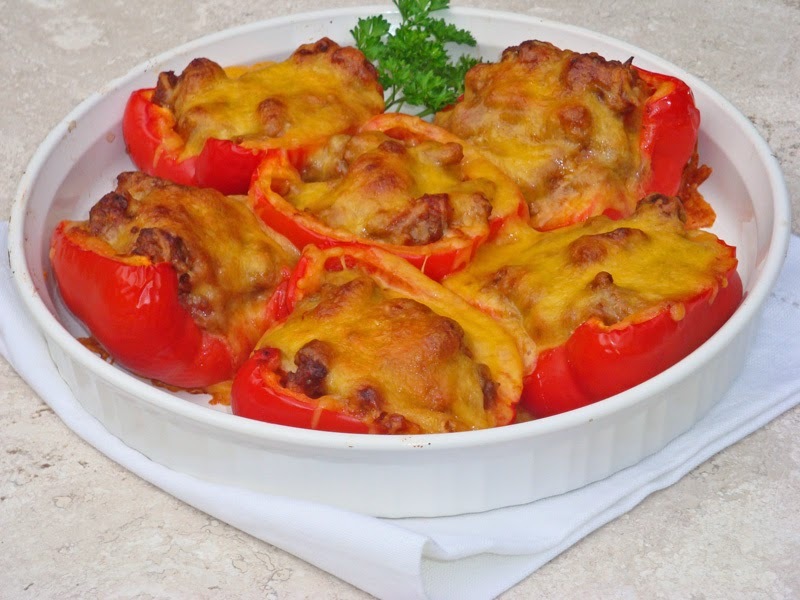 Trade those soggy buns for tender-crisp, baked red peppers! Preheat oven to 350º F. Grease a 9- by 9-inch baking pan or dish. Cook the ground beef in a skillet until it starts to brown. Drain off extra fat and add onion, celery, and garlic (use an extra clove of garlic if sun-dried tomatoes are not packed in garlic-flavored oil). Add dried tomatoes and some of the garlic-flavored oil. Stir in all remaining ingredients except the cheese and red peppers. Simmer 10 minutes. Stir half the cheese into the hamburger mixture. Place peppers in greased baking dish and fill with the meat and cheese mixture. Top with remaining cheese. Bake at 350º F for 20 to 25 minutes until hot and bubbly and peppers are tender-crisp. This recipe was inspired by one on Linda Sue Genaw’s website at www.genaw.com. Thanks, Linda! Note: *Use purchased dried tomatoes packed in garlic-flavored olive oil or increase garlic to 2 cloves and use dried tomatoes that have been covered with olive oil and heated until softened. Red peppers, Sloppy Joes. Bookmark. This looks fantastic. It's printing now and I'll try it. Thanks!